Today is National Croissant Day. There's nothing quite like waking up to a flaky buttery croissant. I have my favorite sources for croissants. I love the ones at La Fournee Bakery in Berkeley (close to my home), and, of course, the many cafes and bakeries in Paris. But maybe you just want to wake up to fresh croissants without leaving home. I've posted this before, but it definitely bears reposting! 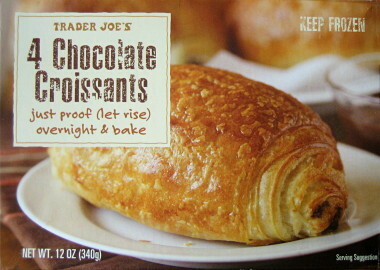 Trader Joe's Chocolate Croissants to the rescue. These are some of the best frozen croissants you'll ever taste. The 'proof' is in the pudding, as they say, and these croissants are proofed (allowed to rise) overnight before they're baked for 20 minutes the following morning. The heavenly smell will take over your kitchen. Perfect for the weekend or National Croissant Day. And, the price can't be beat--$4.99 for 4! In the San Francisco Bay Area, Chef Jean-Yves Charon from Galaxy Bakery is the genius behind Trader Joe's Chocolate Croissants. Rumor has it that Williams Sonoma gets their frozen croissants from the same source. So, Trader Joe's represents a huge savings in cost. O.K., these "Croissants" are really Pain au Chocolat, as anyone can see by the shape. Feel free to imagine yourself at a sidewalk cafe in Paris when eating these! The croissants are incredibly flaky and buttery, so light and airy, and the Callebaut chocolate is rich and delicious. Since there are four to a box, and each croissant contains 18 grams of fat, you might want to offer a few to family or friends. If you don't care what they'll do to your waistline or thighs, indulge and eat them all. They're terrific! This is one product that outshines most home baked croissants. Yes, you can make your own Chocolate Croissants, but these are so good, why bother? You'll find TJ's Chocolate Croissants in the freezer section. I love Chocolate Croissants Do these croissants have Palm Oil or High Fructose Corn Syrup?